We went to Carolina Christmas Monday night and it was a blast! 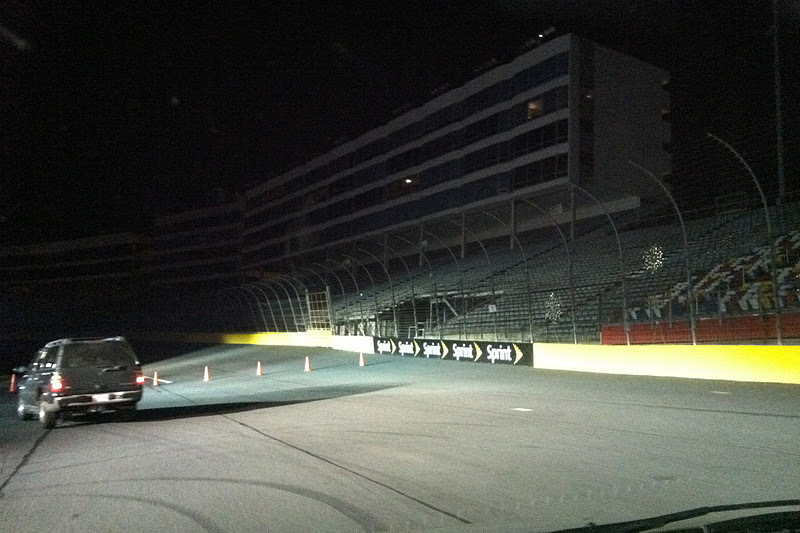 Charlotte Motor Speedway, located in Concord, NC, has set up over 600 LED light displays with over 3 million lights. 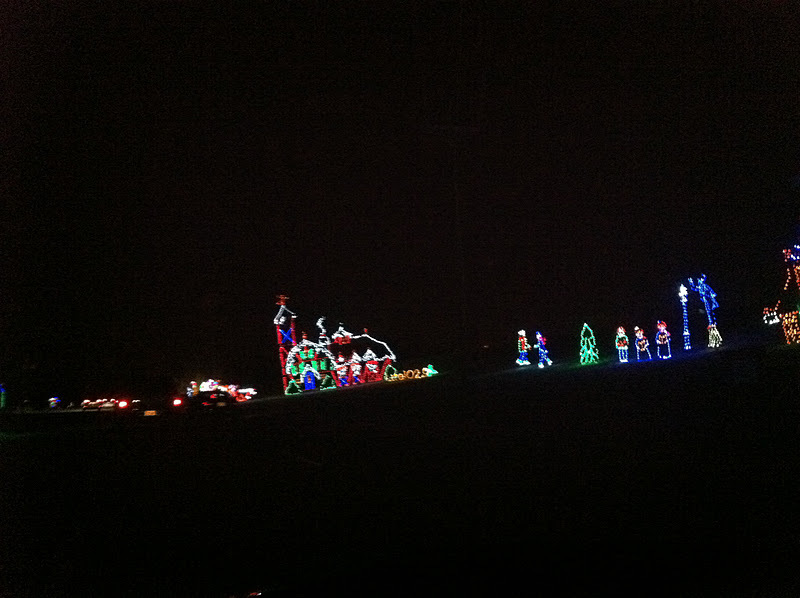 The Speedway is open every night from 6-10 p.m. until December 31. Be sure to check their website for weekend events. Even though the traffic might be more congested, I recommend going Thursday-Sunday so you can see the Christmas Village that has a Bethlehem-themed village, a Festival of Trees, photos with Santa and areas with food and music. As you drive through the dragway and on to the speedway, you can tune into 91.1 to hear holiday music, trivia, and NASCAR drivers talking about their Christmas memories and traditions. 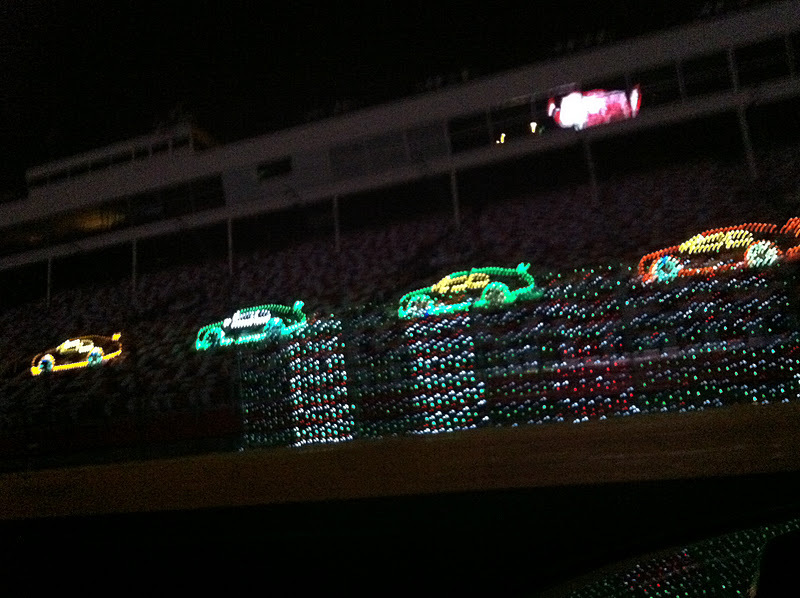 The Christmas light display begins on the zMax Dragway. We went on a Monday night, so there was very little traffic. As soon as you get on the track, you turn your lights off and follow the other cars in your lane. 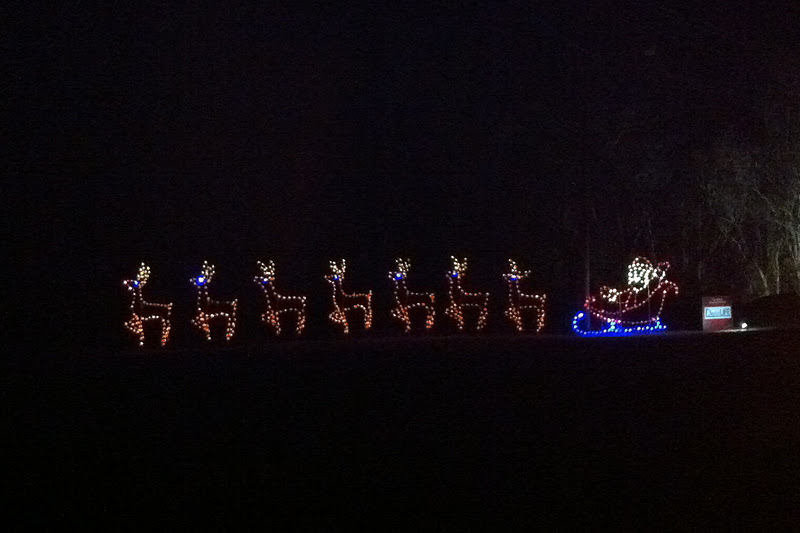 There are festive and fun light displays along both sides of the road. The 3 adults in our car all agreed they weren’t the most extravagant light displays, but for the 4 year old, it was pretty amazing. E was in awe the whole ride getting even more excited with each new display. Her favorite was a unicorn family and some igloos. The adults favorite part was getting to actually drive on the race track. It was really neat! Even though we were only going 5 miles an hour (so wish we could have gone faster!) it was fun- even for non-race fans. I especially like we got to drive on a slanted turn which made you feel like your car was about to tip over. 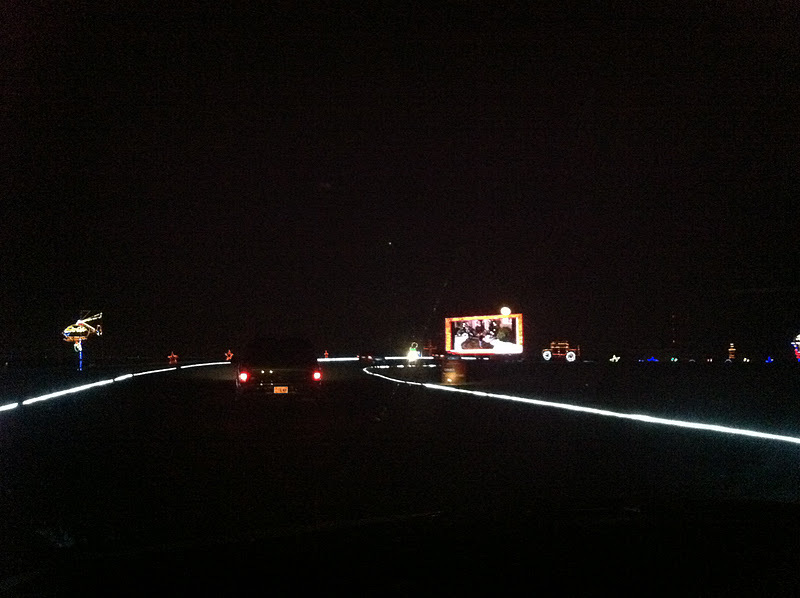 There are several light displays set up on the track and a huge screen which was showing clips from holiday movies. The Christmas Village is also on the racetrack but was closed when we visited. Tickets are $20 per car/SUV which can be purchased online or at the gate. There are group rates as well as pricing for buses and group vans. “Elf,” will be shown this Friday through Sunday evening, Dec. 16-18 at 7 p.m., and “How the Grinch Stole Christmas” will be shown Dec. 23 and 24 at 7 p.m. 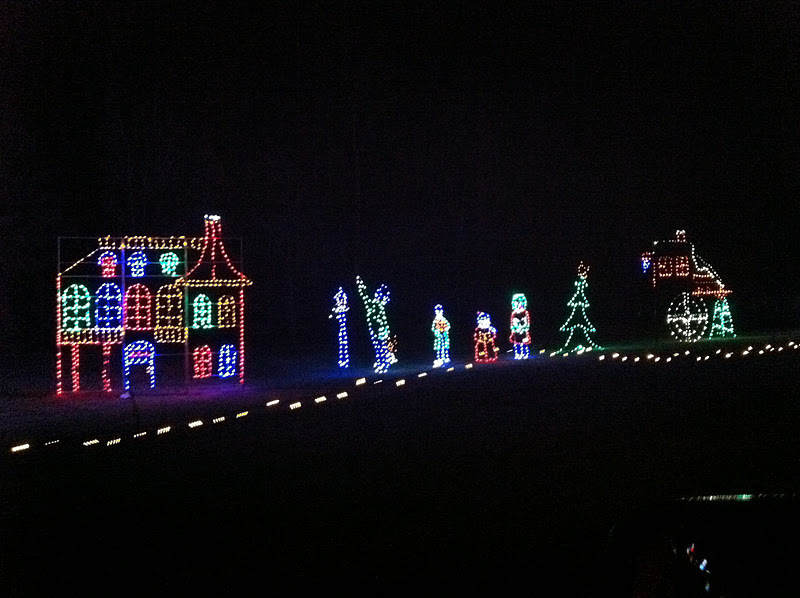 The movies are included with regular admission to the Carolina Christmas holiday light show, which is open from 6 p.m. to 10 p.m.